Iwatana-do Okinawa Kenpo Karate' School - A Martial Arts school serves the Brevard County Florida cities of Rockledge, Titusville, Cocoa, Cocoa Beach, Merritt Island, West Melbourne, Melbourne, Viera, Indiatlantic, Satellite Beach and Palm Bay. "One Student at a Time"
We welcome you to Iwatana-do Okinawa Kenpo Karate' - a Martial Arts school owned by Master Jeffrey L. Riggs in Rockledge, Brevard County Florida, U.S.A. The O.K.K.R.A. Supply Room is here to make martial arts supplies affordable and easy to buy. 25% off of all Century Martial Arts products! The art originated in China with Bodhi Durhama and it's nonviolence philosophy has been maintained. It promotes physical fitness, mental discipline, self-defense, positive self-image, and personal development. 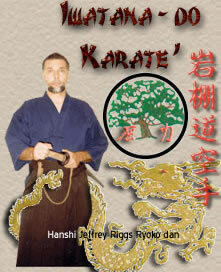 This is done with traditional Okinawan training and contemporary physical fitness techniques. There is emphasis on Kata, Kumite', history, philosophy, confrontational avoidance, and sport competition. You are invited to visit the Iwatana-do Okinawa Kenpo Karate' Okinawa Style martial arts school located in Brevard County, Rockledge, Florida. Children are welcome.